The Dwarf Japanese Maple, or Acer palmatum, is native to Japan, and is part of the large family of Aceraceae, which share common characteristics with most other maple species around the world. With stunning foliage color and heartiness, these lovely trees are ideal specimens for the art of bonsai and with proper care will be a wonderful addition to any bonsai lover’s garden. These trees seem to have a natural propensity to genetic drift with new cultivars and random mutations in seedlings being prolific. This very compact and densely branched, rounded shrub or tree is an outstanding miniature maple that boasts small, bright green leaves with red tips and stems that have a spectacular red-orange color in autumn and interesting branching and structure with it’s rough corky bark in winter months. With its heartiness and beauty, it is easy to fall in love with the Japanese Maple. It is an outstanding bonsai specimen which promises to have fantastic results that are well worth its particular care needs. The Sharp’s pygmy Japanese Maple performs well in zones 5-8, and may lose some of its fall brilliance in zone 9; though it will still survive well as long as given adequate winter protection. Although this bonsai belongs in the outdoors and needs a dormant period, it cannot survive without root protection from frost and heavy wind or in areas where temperatures decline to below freezing for the winter. You will need to keep this bonsai in a frost-free shed or garage after leaf fall for protection. Display maples indoors for a few days at most when in leaf, or for an hour or two when dormant because bringing it inside for longer periods during dormancy risks confusing the tree and starting the spring awakening too soon. Provide your Sharp’s Pygmy Maple with dappled light which is important in the summer and protects the delicate leaves from damage from sun-scorch. Red leafed varieties like the Sharp’s Pygmy are more prone to leaf scorch than green leafed varieties, and also tend to have less vibrant foliage when grown in too much shade, reverting to green from red if not given enough light. A balance must be found between too little light (changing the red leaves change to green) and too much (where the leaf margins scorch). It is also necessary to protect from excessive wind which can be achieved easily with a little care given to ideal placement. Japanese maples require slightly acidic environments, which can be achieved by using rainwater instead of tap water if possible because tap water tends to be slightly alkaline. 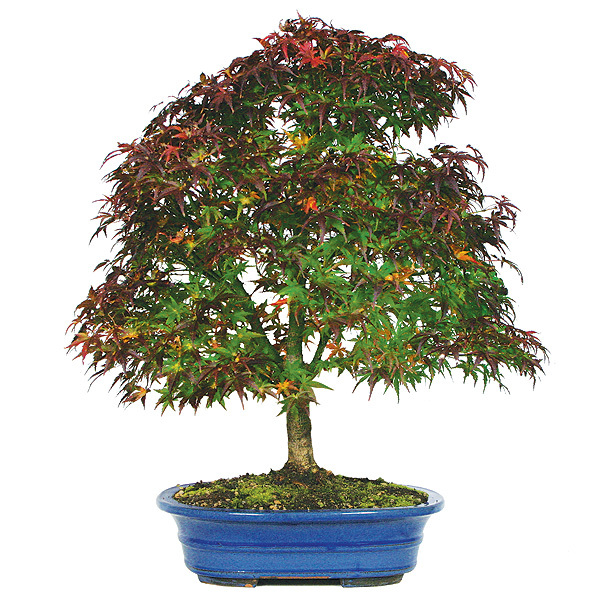 This bonsai will require consistently moist soil at all times as maples do not tolerate drought. That being said, you must also keep it from being waterlogged or boggy to prevent root rot and inability to absorb nutrients from the soil. It is best to water this bonsai before the heat of the day to ensure that the tree has enough water to make it without drying out. If you need to leave your bonsai for any length of time, be sure to give it access to daily automatic watering or give adequate guidance to whoever will care for it in your stead as it should not be neglected if expected to survive your absence. In early spring, feed every week to two weeks with a high nitrogen fertilizer as leaf buds open in spring and will need the nourishment. Once the leaves have hardened off, feed every other week throughout the spring and summer with a diluted fertilizer, taking care to ease up on the strength or frequency during the hottest days of summer. Switch to a nitrogen free formula in late summer/autumn, tapering off before winter. Keep in mind that low fertilization can result in shorter internodes on more developed, mature trees, and too much fertilizer will cause leggy growth. Avoid fertilizing right after repotting; instead, wait until you see new growth, and then start lightly, moving in to stronger summer feeding. Maples can occasionally be dosed with an acidic or alkaline fertilizer if there is yellowing of the leaves. Be sure to pinch out the tips of new shoots when one or two pairs of leaves have formed completely to retain its desired shape in early spring as pruning in late spring to midsummer will lead to masses of new shoots from the internodes. Prune out new, unwanted growth with long internodes. Heavy pruning can be done at almost any time of year as Maples tend to back bud easily, throwing of shots from old and new wood alike. Do keep in mind when shaping that they back bud primarily from internodes; cutting a branch back too far, back beyond the first node, will increase the risk of losing the branch. Wiring can be done almost any time of year, though early spring is ideal because the structure of the tree is clear and visible before buds appear. Because the tree is preparing to put on new growth, the branches will set better. Watch the bark carefully if wiring during this quick growing period because the wire can quickly damage the bark and branch. If wiring in autumn, provide additional protection as the branches will not heal until spring; this is achieved by wrapping the branches with raffia to protect the delicate bark. You will need to rewire in six months (or earlier if you notice the wire starting to bite). Do not wire in winter, as the branches become brittle and break easily. This type of bonsai is suited to many forms, including: broom, informal upright, group plantings, raft, twin trunk, clump and weeping. Japanese maples are usually not prone to infection when healthy but if stressed, they can be prone to aphids and scale. Aphids can infest young shoots in spring, leading to distorted leaves. Spider mites, weevils, and bark beetles (especially if the tree is already unhealthy) can also attack. These can be attacked with a simple solution of 1 tsp dish soap to 1 quart warm water sprayed on the entire leaf zone until runoff occurs. Rinse well with tepid water. Also watch for local caterpillars, as they can defoliate a tree swiftly; these are easily dealt with by removal by hand and a swift stomp with your heel which may sound unappealing, but is really quite effective. They can also be prone to fungal infections from overwatering which will lead to root rot. Though not a disease, Leaf scorch is a common problem with Japanese Maples. It is caused when the leaves lose water faster than they can take it up. This may be caused by exposure to too much hot sun, late/early frosts, drought, drying winds, or a buildup of minerals and salts in the soil, due to an imbalanced pH or over fertilizing. Because growing maples from seeds can be frustrating simply because of the length of time it will consume to become anything resembling a tree it is best to take cuttings in order to propagate your Japanese maple. Take softwood cuttings that are 4-6 inches long, in early to midsummer, just as the new growth is beginning to harden. Many cultivars do not root easily and the failure rate can be extremely high on these. Remove all but the top pair of leaves. Bottom heat has been shown to increase the rate of successful cuttings. Be sure to keep shaded to encourage root growth. In Japanese, Acer Palmatum maples are known as momiji. Momiji can be translated two ways, one as “baby’s hands”, acting as a simile “A little baby extends its hands which are like the leaves of momiji.” (J.D. Vertrees- Japanese Maples.) It is also linguistically related to an ancient verb, momizu which means “becomes crimson leafed”.